Fall came early this year--or was it that summer never arrived? For us, Europe's summer of 2010 was like some summers back home in the US's Pacific NW where the joke is "We had summer yesterday." Like too many of those years, we occasionally had a summery day, but that was about it. The Portuguese were equally disgruntled about the unseasonably cold, wet weather as we left them in late June and we carried their dreary weather pattern with us for the rest of the year. I was horrified when, on August 17th, our dirndl-dressed Austrian Alps hostess quipped "Autumn is here" after I commented upon hiking in falling snow the day before. I wasn't willing to cheerily concede the loss of my summer as quickly as she was. But unlike us, our hostess had had more than she wanted of the heat wave a week before when we were further south negotiating around cool weather and almost daily thunderstorms. We hoped we wouldn't be needing a vintage Inn River boat. But 2 weeks later, at the end of August, we concurred with her pronouncement and packed-up our climbing gear and maps to send them home. Our official hiking season was over. As we headed out of the Austrian mountains we looked back at a dusting of snow that had literally fallen as we had snapped our bags shut. The brilliant sky and snow-chilled winds that morning were a more acceptable farewell to both the summer season and the high mountains than the drenching downpour we'd ride in the following day. I always strongly feel the rhythms of fall and this year was no exception. The sense of withdrawing, folding-up, pulling in, and hunkering down is potent for me and those feelings were made literal by descending out of the mountains with our chins pulled into our collars after sending our now-useless summer hiking gear on its way. The seasonal theme of contraction and retreat is exaggerated by our sensible annual pattern of leaving the mountains at summer's end for the more even-tempered river valleys. In the valleys the storms will dump rain instead of snow upon us; the temperatures won't often drop below freezing; more lodging options will be available; and the sense of isolation will be lessened. "Ho-hum" glimpses of the river on a rare sunny day. But despite the compelling advantages of cycling in the lower elevation river valleys, they're never as exhilarating as being in the mountains. This loss of excitement that comes with being in the valleys has triggered the addition of another fall ritual, which is consciously downwardly recalibrating my expectations each fall. I can no longer sit back and wait to be dazzled by what is around me--instead I must work at being fascinated by what I am experiencing. As we descended from the mountain village of Mayrhofen to rejoin Austria's Inn River, I immediately redoubled my efforts to be satisfied with the boring ride on the very safe bike path that had us in an oversized ditch between a dike and another bank. The long, straight, though rough gravel path that was flanked by weeds and a couple of varieties of deciduous trees didn't match my vision of a stunning outing. But I knew I should be grateful: we were out of traffic, we were spending the day in nature, we were on our bikes, and it wasn't really raining. I recalled the ongoing terror of our late spring riding in decidedly bike-unfriendly Portugal to heighten my sense of gratitude for the current secure but dull path--a path that would have looked heavenly in southwestern Iberia. After I had exhausted gratitude as a way to ease my longing for more delightful surroundings, I turned to my annual fall chore, which is focusing on my riding technic. Nothing like being out of traffic on a flat, straight path to aid in concentrating upon the amount of ankle flexion with each revolution of the pedal; to nudge my lazy left leg to match the power output of the right; and to get those reactive shoulders down in a relaxed position as my hands gripped hard to stabilize the bike's wriggling-about on the loose grit. We longed for enchanting riverbank scenes like this. But revisiting the "should's" of riding position yet again only briefly held my attention, so then it was on to being fascinated by noticing the minutiae, by focusing on the details within the tunnel-like visual space devoid of a normal amount of biodiversity. I rallied my concentration to notice the various shades of green; the differences between the vegetation on the 2 sides of the path; and the transitory imprints of the wind on the grasses. I spiced up my "notice the minutia" assignment one day by demanding new imagery to describe what I was experiencing: "The grit yielding to the pressure of our tires sounded like a crackling fire as we pedaled hard to overcome its resistance"; "The few remaining blooms on the weed's flower stalk ringed it like a limp ballerina's tutu;" and "The near-black, deeply cut soil gleamed like a choppy sea in moonlight." Off the grit path and on asphalt again, I pondered why the road's underlayment fringing the pavement wasn't the same color on both sides. (Later I noticed that a work crew was laying down new shoulder grit by the shovelful, which provided an explanation). Next I was comparing the different shapes of brown stain patterns on the road and guessing as to the causes. Some stains were long streaks probably left by muddy tires just having left the freshly plowed field; others were brown splotches, presumably formed when mud clods dropped from the back of a tractor and were then flattened by passing cars; and the rare, comet-tailed, darker brown streaks must have been made by cars driving over the elongated pine cones that had fallen before they were dry and brittle. Even away from the visually confining dikes, we applied ourselves to at add mental interest to the safe and straightforward, though not always easy, riding conditions. As we were routed through a quiet industrial park one Saturday morning, I challenged us to take turns riding with our eyes closed. The relatively smooth expanse of concrete was wide and flat enough for such advanced training and play. We took turns riding one behind the other to offer corrective information or an urgent plea to "open your eyes" if the challenged rider drifted perilously close to the curb. 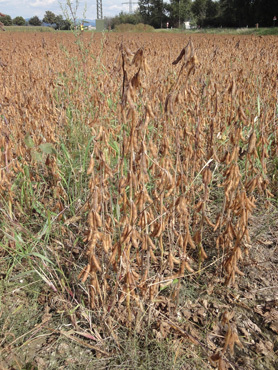 Soy bean plants drying in the field. Less sporting entertainment came from identifying our newest roadside species, soybeans. Plants are often easiest to identify when blooming or going to seed but nothing compares with a clue like the sign "Soyabone." The last half of the word didn't match my grocery-store-German for "bean" but having studied food labels in about a dozen languages over the years assured me that "soya" needed no translation. We stopped at the base of the next hill to pick a fuzzy bean pod from a field and "Yup, it looks like a dried soy bean." Cruising through our electronic encyclopedia that night confirmed the find. The sweet smells of jasmine, honeysuckle, and orange blossoms were long-gone from our touring season and the sensory experience 'up north' in the fall had become almost entirely a visual one. Occasionally a church bell or the call of a lone bird would perk-up our ears; rarely our noses were piqued by the smell of just-cut timber or freshly poured concrete; but most of the time we had to search for sensory delight or stimulation with our visual sense and many days even that was challenging. My whole being brightened when I heard a NASA psychologist on TV (a consultant to the Chileans on maintaining the mental health of the trapped miners) say that the miners needed to have surprises--positive ones--every few days. I was enchanted as I like both to give and receive little surprises and yet I thought that that was a very pedestrian pleasure. Suddenly my lowly surprises were in the big-leagues, in the realm of high-caliber mental health strategies for astronauts. Every day or 2 for weeks after hearing that one-liner comment I found myself again reflecting upon the roles and nature of surprises in my life. I also realized that it was the lack of surprises that made riding places like the dikes monotonous. It's the little surprises that make riding fun: the sight of a white duck with a tufty topknot; a colorful arrangement of flowers in a window box; a heron taking flight; or an exceptional picnic spot. Even very sparse landscapes can make for a satisfying riding day if they deliver enough in the way of intriguing visual surprises. Why Bother With These River Routes? Riding the river routes of Austria this fall was our best crack at an antidote for Map Man's route planning burn-out that set in early this year...something about the impossibility of getting it right on the exceedingly dangerous roads in Portugal had worn him down. He lunged at the late-summer brainstorming remedy of buying BikeLine guide books for the last few months of our touring season as the guides would allow us to keep touring without risking excessive planning frustration. Fortunately, his German comprehension skills had improved enough over the years that the necessary translation work wouldn't be an aggravation. 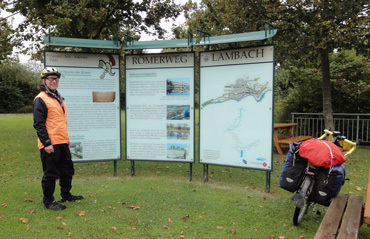 One of the many "Romerweg" signs on the Roman bike route. The German company produces guide books for dozens, if not hundreds, of routes throughout Europe. The routes are most plentiful in Germany and Austria but more importantly, those are the only countries in which you can reliability buy the guides. So we drifted north into Austria after our time was up in the Italian Dolomites and Map Man began devouring BikeLine books after some layovers for hiking. "Innradweg," "Römer Radweg," "Salzkammergut Radweg" ("radweg" = bike route) and others aided him in designing his own melded routes with ease. Then, for several weeks we stumbled upon almost comparable quality, free route booklets in the tourist info offices: we were indeed in Map Man heaven. In addition to literally mapping out a route that would coordinate with marked paths, the free and purchased guide books also included lodging information to answer the endlessly recurring, all-in-important question: "Where is there lodging for the night?" (second only to "Where will we buy the next batch of favorite chocolate bars?") The plan had worked well: Map Man was able to spend less time crafting routes and his satisfaction with the product increased considerably. 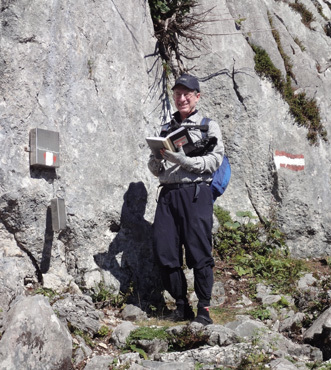 Signing a trail book above Ebensee. Some river routes were more tedious than others but Map Man was always looking for ways to spice them up with museum visits or side trips. He scored with a 5 night detour in which we again veered towards the Alps at the village of Ebensee. Ebensee is favorably positioned with a lake edge at one end of town and with a summer and winter season cable car at the other end. Slipping in a few more hikes on the best weather days that week was a welcome change of pace and scenery. Over and over again as we rode I found myself saying "Austria is pleasant, very pleasant, but not grand." That sentiment was reinforced increasingly as we approached the city of Wels, and then the Danube River, or as it is known in Europe, the Donau. In the town before Wels the guesthouse owner/manager gave us a room for 4 at the price for 2 so we could keep our bikes in our room rather than in his unlocked garage. He then invited us to use the house's clothes washer and dryer at no charge and provided the detergent too. The break from our nightly routine of hand washing our clothes was a precious gift and his generosity was a nice surprise. Upon arriving at Wels, we decided to revisit their tiny Roman museum that we treasured years ago for its dioramas and mock-ups of Neolithic rock drilling and other ancient techniques. However, we were especially disappointed to discover it had moved as the sole staff person when we made our first visit had invited us to stash our loaded bikes inside the museum doors on that rainy day. But, much to our delight, we were again directed to wheel our bulky bikes into the lobby (perhaps by the same woman) of the smart new museum while we toured the halls. 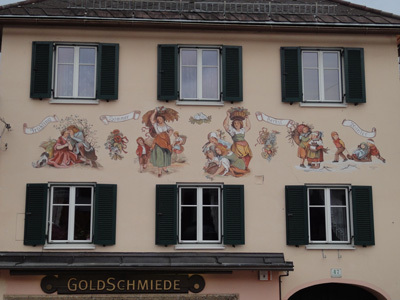 We purred with contentment--another wonderful treat in pleasant but not grand Austria. 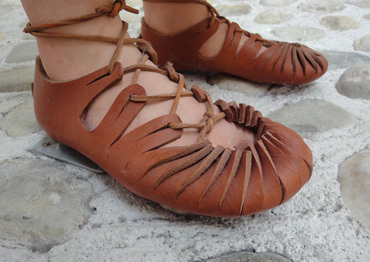 Ever-fascinated by minimalist shoes: Roman sandals at Wels. 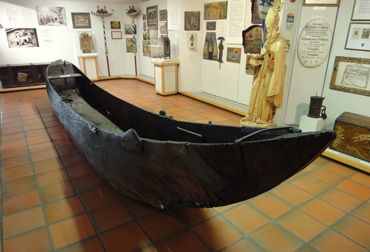 Unfortunately, some of our favorite Wels museum displays didn't survive the move to the new building but we admired their fine upgraded exhibits. The bonus tidbit at Wels this year was that the 3.5 million (or so) year old African skeletal remains known as "Lucy" were named for the Beatles song with "Lucy" in the title as that was the tune playing on the radio when she was discovered. We are endlessly amazed and amused by what we learn and where we learn it. Once we left Wels, it wasn't long until we were on the Donau, which is not a favorite river of ours to ride. Memories of bland riding preceded our arrival--memories of endless miles of flat terrain along a too contained river with little to captivate our minds. But hitting the Donau at the town of Enns proved us wrong and Bill quickly remembered that "Dullsville on the Donau" was closer to Vienna and not upstream where we were. And his longing to again see river barges was instantly satisfied as we joined the Donau Radweg. Here was the best of river riding: dedicated, out-of-traffic, asphalt paths; signs and services; charming water's edge villages eager for cyclists to stop for a beer or for the night; and the sight of fishermen, mobs of other cyclists, old towns, and watercraft to reward our roving eyes in search of surprises for our restless minds. 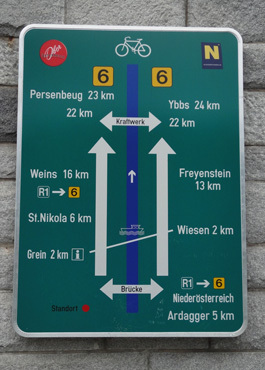 Signage on the Donau bike "autobahn." 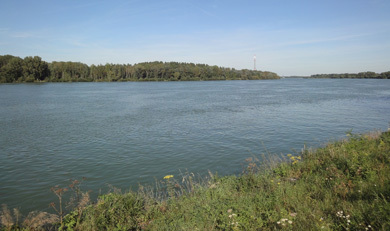 While parts of the Donau River are visually tedious, the busy parts of the Donau Radweg itself are a kick because of the culture. It's one of the longest bike routes in Europe and it has got to be the most heavily traveled long distance route. We always think of it as the cyclist's autobahn as it is mostly flat and it is the quickest way to scoot around Europe on a bike. In addition, it draws packs of riders, many of whom are on rented bikes and are using shuttle services for hauling their luggage each day. 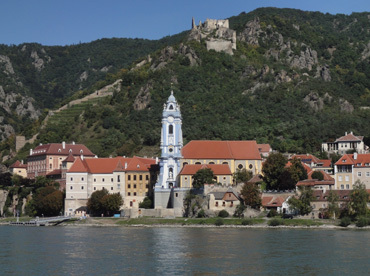 All sorts of package deals are available to pedal the Donau with ease, including self-guided itineraries with pre-arranged lodging and fully accommodated group tours. Our image of a typical "Donau Rider" has become codified and the phrase has been added to our personal lexicon as an endearing term for an easy-going (often very upright) cyclotourist. We're always delighted to ride with the congenial crowds on the Donau for a few days for a break from our relatively solitary times on the roads and less popular paths. We rarely see more than one or 2 friends each year while we are abroad but we are comforted by encountering many 'virtual' old friends along the way. One night as Bill was once again culling maps, brochures, and other tourist information, he handed me a map of "Jakobsweg Durch Ganz Europa" or the pilgrimage routes of Europe heading to Santiago de Compostela, Spain. "Jakobsweg" has become one of our virtual old friends as some years, like this year, we see dozens of trail signs and stickers on road posts indicating that we are on a route or intersecting it. We quickly discovered that there was not a single route to Santiago de Compostela but many. We've also learned to spot some of the pilgrims who often wear a shell around their neck, on their backpack, or dangling from a walking staff. When close to a major route, we are often asked if we are pilgrims. Even knowing that there were several pilgrim routes, I was surprised by the overview on the back of this map for Germany that showed all of Europe as it looked like a map of major road systems. I gave up trying to count or even imagine how many routes there were as it was mainly a dot-to-dot connection of the important towns or cities along the way. The eastern edge of the map indicated routes coming in from east of Prague, Vienna, and Zagreb, Croatia and northern routes from central Sweden. No wonder "Jakobsweg" was one of our old friends that we often encountered. Riding the designated river routes of Austria this fall was an even more successful planning strategy than we had expected. Some of the riding was tedious but even those less-than-stellar days met our primary objective by delivering a big dose of daily outdoor exercise. As expected, following the published and posted river routes added enormously to the planning ease and kept us happily out of traffic. Renovated Austrian old town's were always worth a visit. The level of effort varied a lot from day to day as the elevation gain would be a mere 70' one day and over 700' the next. But the most unexpected issue on the river routes was finding lodging. Our BikeLine and free guide books were a huge help in the hunt each night but we had more than our usual number of problems in finding places to stay while in Austria and as is often the case when we have trouble finding lodging, it wasn't any one thing. One rural village that was to be our destination for the night was inundated with road construction workers necessitating unhappily riding well past our dinner time to find lodging. Later on at Graz, the second largest city in Austria, and its bikeable surrounds, were besieged by 10,000 marathoners one weekend forcing us to park ourselves for 3 nights instead of the planned single night. In a number of other towns we never knew what the issue was, or if it was a single issue, but we couldn't stop as planned. Too many cold late afternoons we found ourselves having a fortifying snack so as to press on when we longed to be off the road and eating dinner in our room. Sometimes the issue was finding any lodging at all, other times it was in search of lodging that was something less than double our usual price point. But the benefits of riding Austria's rivers this fall by far outweighed the shortcomings and we may take a cue for next year from this experience by riding some different routes. As our touring season is drawing to a close, we are traveling along and near the Po River in central Italy hoping to enjoy some reasonably comfortable weather, with some success. Tranquil riding days are harder to come by in Italy than in Austria but the scenery is always full of surprises. We'll take a train back to Vienna on Thanksgiving Day and from there we will journey to Amsterdam for our flight home on December 2.